University of Miami athletic director Blake James says it's good to have a basketball corruption trial in the past and with no indication of wrongdoing by coach Jim Larranaga's Hurricanes' program. CORAL GABLES, Fla. (AP) — University of Miami athletic director Blake James says it’s good to have a basketball corruption trial in the past and with no indication of wrongdoing by coach Jim Larranaga’s Hurricanes‘ program. 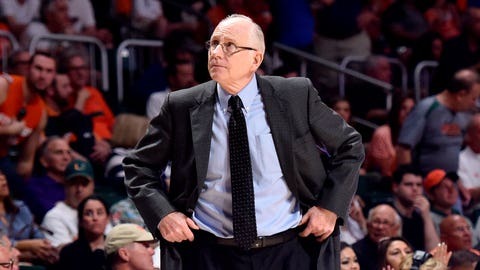 “He’s my boss, so I agree with him,” said Larranaga, with a grin.